As many of you know, it's been a goal of mine for some time to start an adaptive paddling program in New Mexico. Many positive developments have evolved over the past few months and the program is really starting to take shape. In the beginning, my focuse will be serving disabled veterans from Afganastan and Iraq, though all veterans are invited to participate; especially those who are already paddlers. Eventually, I'd like to work with at-risk youths as well, pairing Vets with Kids; Big Brother/Big Sister style. That's well down the road though. Our mission is to provide physical education, recreation, rehabilitation and socialization so that these men and women can experience for themselves the freedom and adventure kayaking has to offer as well as the camaraderie the paddling community has to offer. 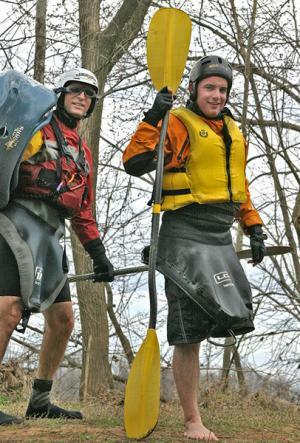 Paddlers - those are volunteers just like you, instructors and people who generally love the sport. Places - I'll work with CABQ, YMCA, Sports & Wellness, Defined Fitness and others who have indoor pools to see if we can get a place to meet hourly on a weekly basis (more or less, depending on turnout rates, rental cost, etc). As these vets progress, I'll take them down the Rio Grande through town, the Orilla Verde State Park, Racecourse and other regional destinations; Colorado, Lake Powell, Glenn Canyon, etc. People - these are the veterans themselves. I'll be looking into a number of places, including other non-profits serving this group, Albuquerque chapter of Wounded Warriors, Department of Defence, VA Hospitals, etc. to find those here in Albuquerque. Still, if you know of any vets, please let them know about this program. Providers - these are doctors, therapist and other networks who can help publicize the program and make referrals. Creating a healthy lifestyle - from providing physical therapy, developing a "support" community, to regularly scheduled paddling events, and involvement in the paddling community. Developing Leaders - Those who reach out to other disabled vets, volunteer at pools, river trips and other adaptive paddling events, to instructing other disabled vets and perhaps on to paid staff, when the program matures. These are the very goals and processes I've used to work with able adults and kids for some time. So, it makes perfect sense to combine these groups. If you're looking for more river time, or more time in a seat, this is a great way to get it! The program will strive to do the training at no cost to the vets, their families and/or their support groups. Individuals who have taken my class can volunteer at no cost, and I'll bring the boats and gear, provided the Vets have the most suitable boats and gear they need. Referrals - Please forward this to any veteran you know, their immediate family or support group. Many of these individuals, due to their condition, live in isolation. Volunteers - We need all kinds of volunteers; recreational paddlers, people to help in the pool, instructors and assistant instructors, safety boaters and organizers. I've enabled commenting on the site (pending approval), so please feel free to share your thoughts below. If you're interested in volunteering, please let that be known below, as well as what capacity you're able to volunteer. "Go confidently in the direction of your dreams! Life the life you've imagined."